This collection of Feldenkrais Awareness Through Movement (ATM) audio lessons and brief talks is designed to help you learn more comfortable, lively sitting at home, at work, and even while driving or traveling. All these lessons approach what the Feldenkrais community calls “dynamic sitting” in different distinct ways, emphasizing different awarenesses and types of movement. You can start at track 1, 5, or 6 based on comfort and convenience, but eventually try to work through all of them. Tracks 1-4 are an 85-minute workshop, designed for Feldenkrais beginners, with two short talks and two lessons. You’ll need a simple, level chair. For a portion of track 2 you’ll also need to lie on a mat. Track 5 is a standalone floor lesson. You’ll need a mat, not a chair. 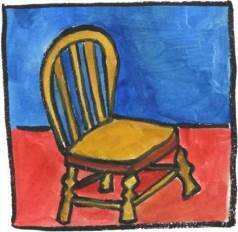 You can even start with track 6, which is a standalone, entirely chair-seated lesson. If you’d like some introductory principles, read About Dynamic Sitting. After you’ve explored tracks 1-4, click here to read the written principles I emailed to the workshop participants. Lessons can be repeated as you wish, so follow your curiosity! If a lesson isn’t comfortable initially, it’s fine to skip it and come back to it later. Before you begin read this first to learn your responsibilities as an ATM student and practical tips to help you get the most from your studies. Scroll down and click on a lesson title to go to its audio player, interactive lesson notes, and discussion comments. Descriptions of each lesson give you a sense of its aim, though everyone’s learning process is unique and you may find other benefits. Safety first: As stated clearly in the recordings, if later you are practicing how you sit and move in your car seat, please practice only when the car is parked. A five-minute talk. Nick introduces the workshop, and discusses how to stay comfortable in the lessons, and why we're often tempted to try harder than is useful for the learning and improvement process Feldenkrais harnesses. The sitbones are discussed. The workshop's handout graphics are in the Curiosities tab of the lesson notes below the audio player. Chair-seated, with a middle portion in back-lying. Identifying the sitbones and enriching your awareness of them, then developing the relationships between the head, sitbones, and spine as they relate to plumb (the line of gravity through the vertical skeleton). Introduces the classic Feldenkrais pelvic clock image as a way to refine and expand dynamic support possibilities for the sitbones, pelvis, and whole self. A second brief talk in the workshop. Nick discusses the value of sitting dynamically and moving as an integrated whole, no matter what constraining situation is expected of you. Modern cultural expectations and chair design are discussed as the major factor in our sitting challenges. The underlying principles of the workshop are briefly named and discussed (they're described in more detail in a page linked in the Curiosities tab). Chair-seated. This brief lesson directly follows up on the previous one and is intended to be explored after a short break, after doing the prerequisite lesson, Easier Sitting Workshop Lesson 1. Turning relationships of the head, eyes, chest, pelvis, knees, and sitbones are explored, using imagery of sitting in the driver's seat. Mostly back-lying. Begins and ends in floor-seated. With explorations and benefits for all sitting situations, this lesson uses imagery of being in the driver's seat to promote lively, dynamic sitting and turning while negotiating the challenge of a typical "bucket" car seat. Postural expressions of rounding and arching are clarified, then used to improve the range, comfort, and awareness of whole body turning movements. This chair-seated lesson focuses on clarifying the skeletal support provided by our sitbones and discovering their lively role (and roll!) in all seated movements, with some emphasis on side-bending. All three planes of movement are discussed, explored, and differentiated, first in "pure" forms, and then blended together into natural movements. After you complete the collection, returning to favorite lessons or progressing through from the beginning again will yield new insights. It can be very surprising to new Feldenkrais students how lessons you “know” are a completely different, valuable experience on subsequent explorations. You might also want to browse our Learning Guides for ideas to help bridge your Feldenkrais learning into everyday life, or continue your studies with our Freeing the Spine, Chest, Shoulders, and Neck collection.